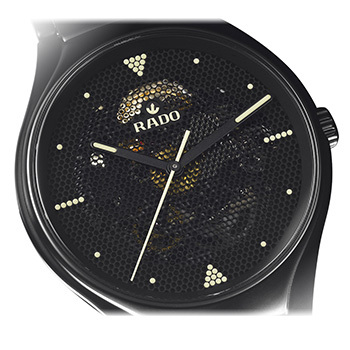 Rado is a Swiss firm with a passion for both watchmaking and materials engineering. This company is part of Swatch Group. In a Rado watch, scratch resistance is of the utmost importance, and this generally influences case shapes and designs. The company’s watch shapes might be compared to a knight’s armor just as well as a watch. This is because contours and edges are strategically planned for the purpose of deflecting scratches and impacts. Often, special machining techniques must be used in order to create watch parts from the ultra-hard ceramics in these watches. "A scratch-proof legend!" Rado builds watches that will stay pristine for a very long time. Rado watches Reviewed by Paul Anthony on June 6th . Though its beginnings trace back to Schlup & Co. in Lengnau, Switzerland, the Rado brand didn’t emerge until the 1950s. The brand’s current pursuit of unparalleled scratch resistance started in the 1960s, when it developed the DiaStar. The current aesthetic of this company’s watch lines originate with the DiaStar, and continues with ongoing research into ceramics. Certainly, Rado continues to improve ceramic, carbide, diamond and sapphire technologies for its Jubile, DiaStar, HyperChrome, and V10K lines. Keep reading to learn about the history of this watchmaker with a flair for exquisite hardness in watch components. Otherwise, skip ahead with the links below. Rado’s Predecessor: Schlup & Co.
What Is A Tungsten Carbide Or Hardmetal Watch? What Is A Rado Jubilé Watch? Similarly to many other Swiss watchmakers, Rado’s very beginnings are in a family home business. Brothers Fritz, Ernst and Werner Schlup began Schlup & Co. in their parents’ Lengnau, Switzerland home in 1917. Schlup & Co. focused chiefly on ébauche, the creation of movement blanks to serve as the basis for assembled watches. During the next few decades, Schlup & Co began releasing watch collections of its own. Although there were many of these, the most popular were Rado and Exacto. The latter of these, however, was difficult to copyright in Spanish-speaking countries. During the 1950s, Schlup & Co. changed over to the Rado name. Its first successful watch in this era was the Green Horse, a variant of the Exacto Oceanmaster. This was a water resistant watch sold especially to Asian countries, where it performed well. Because of the Green Horse’s success, other Horse series watches soon came out: Purple Horse, Silver Horse, and Golden Horse. Out of these, the Green Horse and 18K gold Golden Horse that came afterwards are the best-known today. This was distinct from “scratch resistant,” since the hardest case materials in watches at the time were typically steel alloys. Although steel is harder than gold and silver, it is soft and ductile next to what Rado had in store. The case of the original DiaStar, still available today, is made from golden or silver-colored tungsten carbide, also known as hardmetal. Together with a sapphire crystal, this case protects an automatic ETA mechanical movement with a date display. A sapphire crystal protects the DiaStar 1’s dial, which is not unusual today, but was rare at the time. Sapphire watch crystals had been around since the 1950s, however, no one had yet embraced them like Rado. This was apparent in 1976’s Dia 67 Glissière, a square watch with a nearly edge-to-edge sapphire crystal over its face. Tungsten carbide is usually used for drill bits and other components that must endure high temperatures and pressures without deforming. It rates the same as sapphire, for example, on the Mohs hardness scale. Most stainless steel alloys soften as they approach 1,000°C, whereas tungsten carbide withstands nearly thrice that. Because of its extreme hardness, shaping hardmetal into intricate shapes is a difficult proposition. The conception of the DiaStar’s distinctive case shape was primarily for this reason. Because of the cutting techniques used, the shape is almost gem-like, similar to a cabochon. Because diamonds are the hardest natural material, it stands to reason that Rado would pay them tribute. Diamond-set watch variants from all of the company’s collections previously had the designation “Jubilé,” due to the gems’ luxury status. For example, the DiaStar Original Jubile is now the DiaStar Original Diamonds. The watches themselves are identical and, in fact, the word “jubilé” is still inscribed on their dials. Besides setting watches with diamonds, Rado has, naturally, used diamonds specifically for their hardness. On the V10K, nanocrystalline diamond coats the case during its vapor deposition process, resulting in a hardness of 10,000 Vickers. 10,000 on the Vickers scale is the hardness of diamond, hence, the V10K name describes the watch’s extremely hard surface. The watch itself has an ultra-minimalist aesthetic; to illustrate, three rectangular planes define the case, which lacks even a crown. Although watches with ceramic bezels and dials are common, few brands offer fully-ceramic cases and watchbands. Because ceramics start with malleable clay, ceramic cases can take on a wider range of shapes than carbide cases. Rado offers watches in two different types of ceramics besides traditional ceramics: plasma high-tech ceramic, and Ceramos metal ceramic. The plasma ceramic is similar to the company normal high-tech ceramic, but a plasma treatment melts the outer surface. This creates an exterior that is smooth and shiny, due to a surface with fewer microscopic pores than untreated ceramic. Metal ceramics, such as Ceramos, include a metal alloy in the ceramic mixture. This gives a bright and unmistakably metallic appearance to the watches, whether with a matte surface or smooth polish. There is a tradeoff when using ultra-hard materials like ceramics or the DiaStar’s tungsten carbide, however. Because they resist denting and scratches more readily than metals, hard materials are prone to cracking rather than denting. Hence, carbide and ceramic watches look brand-new for a long time, as long as they don’t fall onto hard surfaces. This is similar to the tradeoff between, for example, acrylic and sapphire crystals. Sapphire does not need regular refinishing, but can shatter during a fall. Ceramics are also hypoallergenic, in contrast to, for example, rose gold, stainless steel, and other nickel-containing metal alloys. Ceramics were the next step in Rado’s progession of scratch-proof engineering, and certainly easier to shape than carbides. The 1986 Integral used ceramic in both its rectangular case and linked bracelet. Stainless steel appeared in both of these, in order to support the ceramic components. The outward-facing black ceramic panels of the bracelet links afforded high scratch resistance, while steel elements added appealing contrast. In 1990, the first Ceramica arrived on the market, sporting a case of the same width as its bracelet. Though the Ceramica has a minimal, modern aesthetic, its shape recalls the rectangular watches popular before World War I. This was the brand’s first ceramic watch where the bracelet has no visible metal parts. This watch’s case is ceramic except for the sapphire crystal and titanium caseback, since a metallic caseback allows for waterproofing. While not the first fully ceramic case, Rado’s new processes and proprietary ceramics made these components ready for mass production. Like many Rado watches, most Ceramica watches use quartz movements, however, an automatic mechanical variant came out in 2017. The True series, with sleek monobloc case and linked ceramic bracelet, offers both minimal simplicity and eye-catchingly unique visual design. The True Open Heart, for example, reveals its automatic movement through a skeletonized dial that frames the movement’s spinning wheels. Also, a limited edition True Automatic Open Heart a 0.6mm-thick mother of pearl panel as its dial. This creates a semi-transparent, ethereal view into the movement’s workings, while leaving the dial and its markers easily visible. Besides these, Rado works with fashion and interior designers to come up with unique ideas for new True models. For example, Swiss interior design studio Big Game collaborated with the brand to create the True Phospho. This is an open heart watch, however, one with an industrial take on the concept. The Phospho’s dial is a perforated black brass grille, creating openness while retaining dial visibility like the mother-of-pearl True. Fashion designer Kunihiko Morinaga’s offering is the True Shadow, with a dial that darkens when exposed to ultraviolet light. Indoors, the dial is totally transparent, giving a clear view of the movement below, but becomes near-opaque black in sunlight. The True Thinline certainly lives up to its name with ultra-thin fully ceramic style. With a modern-looking round monobloc monochrome case, the True Thinline fits a 1mm-thick quartz movement into a 4.9mm-thick case. A minute and hour hand float over a dial that displays the Rado logo, but is otherwise blank. This collection also comes with automatic movements; here, a 3.6mm-thick ETA 2892 sits inside a 7.8mm-thick case. This automatic movement displays itself prominently in the limited edition True Thinline Skeleton, but this model is exceedingly rare. This is because the Skeleton version had a run of only 99 pieces. The brand’s ceramic technologies also appear in more watches with a more traditional appearance. For example, the DiaMaster is a classy dress watch with a round case, straight lugs and narrow bezel. This watch’s ceramic case features a plasma surface treatment that gives a silky-smooth metallic shine, but preserves the scratch resistance. Many models in this collection have an off-center secondary subdial, for instance, the DiaMaster Grande Seconde and DiaMaster Power Reserve. The Grande Seconde displays the seconds with its subdial’s hand, while a date window shows the date. The Power Reserve indicates how much remains of its 80-hour reserve in 8 increments, therefore each increment represents 10 hours. We hope you enjoyed this summary of Rado’s history, the technology behind its watches, and some of its milestone models.